Turkey’s anti-democratic mentality has not changed since its foundation, but it has never been as oppressive as today, said award-winning Turkish human rights lawyer Eren Keskin. Over the years, Keskin played a vital role in strengthening civil society awareness in Turkey. She became involved with the Human Rights Association (IHD) three years after its 1986 founding and headed its Istanbul branch for years. She has been arrested and imprisoned numerous times, accused of terrorist ties for defending Kurdish rights, and won several international honors for her activism, including the Aachen Peace Award, the Theodore Haecker Prize, and just last year, the Helsinki Civil Society Award. #JMAvocatsDanger : c'est aujourd'hui ! Le juriste Mohamed Zaree, fervent défenseur des libertés d’expression en Egypte, a remporté le 10 octobre 2017 le prix Martin Ennals, l’une des plus prestigieuses récompenses dans le domaine des droits de l’Homme. Le lauréat n’a pas été autorisé à se rendre à Genève pour recevoir sa distinction. Mohamed Zaree, directeur du bureau égyptien de l’Institut du Caire pour les études sur les droits humains (CIHRS), n’a pas le droit de quitter le territoire égyptien depuis mai 2016. L’activiste égyptien est sous le coup d’une enquête judiciaire qui pourrait lui valoir une lourde peine. «Les chefs d’inculpation dont je fais l’objet suffiraient à m’envoyer en prison pour 25 ans», explique-t-il dans une vidéo diffusée lors de la remise du prix Martin Ennals. C’est sa femme qui a fait le déplacement en Suisse pour réceptionner le prix décerné par une dizaine d’organisations internationales comme Amnesty ou Human Rights Watch. Mohamed Zaree, 34 ans, est accusé de bénéficier de fonds étrangers. Sous la pression des autorités, le siège de son organisation de défense des droits de l’Homme a été transféré à Tunis en 2014. L’activiste égyptien a choisi de rester dans le pays pour mener le combat de la liberté malgré les menaces de mort et les intimidations. Une nouvelle loi promulguée en mai 2017 par le président égyptien Abdel Fattah al-Sissi impose des restrictions sans précédent aux ONG. Zaree was one of three finalists, along with Karla Avelar (El Salvador) and Free the 5 Defenders (Cambodia), selected in April from among hundreds of human rights defenders around the world. Today, October 10, 2017, at the awards ceremony in Geneva, Switzerland, the panel of ten judges representing major human rights organizations around the world,announced it had chosen Zaree as this year’s laureate. Zaree could not attend the ceremony due to a travel ban from the Egyptian authorities. The award was granted in recognition of Zaree’s leading role in advocating for the freedom of association and expression and his coordination of joint action among independent Egyptian rights organizations. Zaree risks life imprisonment and has been banned from travel, while the assets of the his Egypt office as well as those of CIHRS director Bahey eldin Hassan have been frozen. Kate Gilmore, the UN Deputy High Commissioner for Human Rights, gave the award to Zaree’s family, who accepted it on his behalf. Selected by a jury of 10 global human rights organizations, including the ICJ, Mohamed Zaree is a devoted human rights activist and legal scholar whose work focuses on human rights advocacy around freedom of expression and association. Mohamed Zaree is also known for his role as the Egypt Country Director of the Cairo Institute for Human Rights Studies (CIHRS), which works throughout the Arabic speaking world. He assumed this role after government pressure on CIHRS prompted them to relocate their headquarters to Tunis in 2014. The Egyptian government has been escalating its pressure on the human rights movement. Human rights NGOs and defenders are confronted with a growing wave of threats, harassment, and intimidation, legal and otherwise. 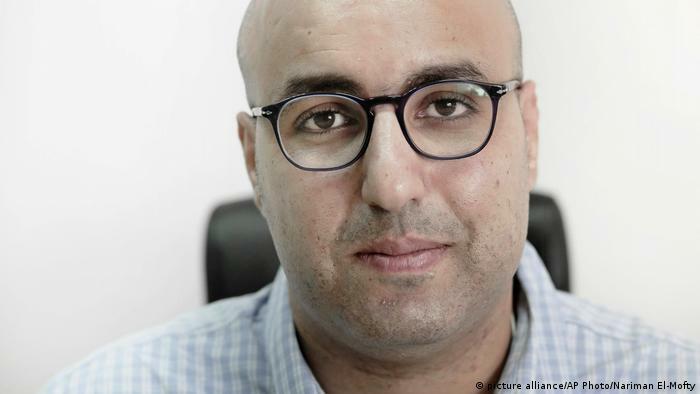 Despite this, Mohamed Zaree is leading CIHRS’ research, human rights education, and national advocacy initiatives in Egypt and is shaping the media debate on human rights issues. During this critical period for civil society, he is also leading the Forum of Independent Egyptian Human Rights NGOs, a network aiming to unify human rights groups in advocacy. Zaree’s initiatives have helped NGOs to develop common approaches to human rights issues in Egypt. At an awards ceremony on Tuesday in Geneva, dignitaries from the United Nations and the Swiss government, along with diplomats and members of the international human rights community, will come together to recognize the work of human rights defenders worldwide at risk of persecution. But one seat will be notably empty: that of Mohamed Zaree. Egyptian activist Zaree is one of three finalists for the prestigious Martin Ennals Award — often called “the Nobel Prize for human rights” for its global scope and recognition. It’s named after Amnesty International’s esteemed former secretary-general. Zaree will not be present to find out if he has been selected the winner by a jury comprising representatives from 10 leading international rights organizations, including Amnesty and Human Rights Watch. He can’t leave Egypt because he was slapped with a travel ban by the Egyptian government last year. Still, the 37-year-old activist says he’s very grateful to be nominated for the award, if anything for the extra security it could potentially give him by raising his profile abroad. This year’s Martin Ennals Award ceremony is today! Join us at 6PM, Uni Dufour, at Auditorium Jean Piaget (U-600). Meet the finalists or their representants, learn about their work, and contribute to their protection! The ceremony is open to public and the entry is free. You are not in Geneva? Don’t worry, you can follow the live streaming right here on our Facebook page. Show your support: come to the ceremony or watch our Facebook live, leave a comment or a like. Each year, the jury of 10 International Human Rights NGOs selects the Laureate of the Martin Ennals Award. This award provides the finalists and laureates protective publicity to continue their work, as well as opens doors to high level discussion on human rights. The annual ceremony takes place in Geneva, in October, in association with the City of Geneva. The Martin Ennals Award takes its name from Martin Ennals, Secretary General of Amnesty International between 1968 and 1980. He was active in the creation of HURIDOCS, SOS Torture (later called the World Organisation Against Torture), Defense for Children International, Article 19, and finally International Alert. Mohamed Zaree lutte contre les lois limitant les ONG qui travaillent sur les droits humains, notamment la liberté d’expression et d’association. Son organisation, l’Institut des études des Droits Humains du Caire (CIHRS) a dû se délocaliser à Tunis en 2014, à cause de la pression grandissante du gouvernement égyptien sur les défenseurs des droits humains. Cependant, Mohamed a pris la courageuse décision de rester en Egypte pour y continuer son travail. Mohamed ne peut pas quitter présentement l’Egypte car il a reçu l’interdiction formelle de voyager et continue à recevoir des menaces de mort pour son travail en tant que défenseur des droits humains. Malgré cela, Mohamed persévère dans sa lutte pour convaincre le gouvernement qu’une société civile forte et dynamique, avec des citoyens libres de s’exprimer, renforce la stabilité de l’Egypte.